Gex: Enter the Gecko (also known as Gex 3D: Enter the Gecko or Return of the Gecko; or on N64 as Gex 64: Enter the Gecko) is a platform game released in 1998 for the PlayStation, Nintendo 64, Microsoft Windows and the Game Boy Color. In 2011, it was added to the PlayStation Network. 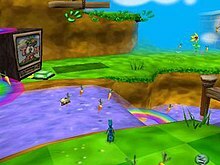 It is the second game in the Gex series, and involves collecting three types of remotes to unlock different TVs in the hub world that lead to levels, and to aid in the fight once again against Rez. The eponymous gecko protagonist is voiced by Dana Gould in the American version, and Leslie Phillips in the British release. Following his victory over Rez in the Media Dimension, Gex has retired from the public eye and turned to solitude. Two years later, his quiet life is soon turned upside down when one day he was watching television when all of a sudden, it goes blank and Rez's image begins flashing on the screen. Two government agents appear and abduct Gex to their headquarters, in which Gex is interrogated. The agents explain that Rez has returned and they need his help in taking him down again. Gex refuses, saying that he's already saved the world once and that they should try to find someone else. When the agents make a fair negotiation for a huge sum of cash and gadgets, Gex tells them everything. He accepts the mission, to which he leaves the building and is then accosted by a female agent who introduces herself as Agent Xtra and wishes him good luck. After navigating numerous television channels in the Media Dimension, Gex finally confronts Rez and the two battle once again until Gex drops a huge television set on Rez severely weakening him. In desperation, Rez tells Gex through a television that he is his father. Gex merely turns the television off; whether or not he believes Rez is unknown. In the final scene, Gex shares a hotel room with Nikki from the Pandemonium series. Gex in a cartoon level. The paws at the top represent his remaining health, and the carrots in front of him are collectibles, when a certain number are collected the player is given an extra life. When Gex stands on the green button across the water, they will finish the level if the requirements have been met. Enter the Gecko is the first 3D game in the franchise. His main move set involves a tail whip attack, bouncing on his tail, using his tongue to eat flies, and performing a flying karate kick. He can also climb up on certain surfaces, and use machines. The game takes place in a large hub filled with several TV screens based on various genres, parodying various genres from Looney Tunes to Star Wars. Each level has a certain number of remotes to collect, as well as an additional remote collecting 120 collectibles within the level. Collecting enough remotes unlock new areas, bonus levels, and boss levels. Collecting all of the possible remotes unlocks a special ending showcasing concept art for the game. The game uses a camera system in which the player can choose from three camera control options. Some enemies in the game can only be defeated by doing certain puzzles. Gex can also use object or machines to aid him in his quest. Gex constantly shouts out puns referencing popular culture from the late 1980s and 1990s when he dies, enters a level, attacks, beats an enemy, or collects items. The Nintendo 64 version of Gex: Enter the Gecko was entitled Gex 64: Enter the Gecko. This version features a new level, which replaced the three secret levels. It is titled "Gecques Cousteau", a play on the French diver Jacques Cousteau, and is centered on the RMS Titanic, and played almost entirely underwater. Other changes include fewer bonus levels, fewer quotes (due to the Nintendo 64's cartridges storage limitations), and some altered sound effects. The only normal level that was removed was Scream TV's "Poltergex". The three secret levels that were removed were The Pre-History Channel's "Lava Daba Doo", Scream TV's "Texas Chainsaw Manicure", and Rezopolis' "Mazed and Confused". Two bonus levels titled "I Got the Reruns" and "Trouble in Uranus" were also removed. Dana Gould wrote quotations for Gex and thought up different costumes for different levels. He voiced him on the American version. In early 1997, Crystal Dynamics announced that they were working on a 3D sequel to Gex in the style of Super Mario 64. Gex: Enter The Gecko was built upon the same engine that was originally used for the first Tomb Raider game. Crystal Dynamics originally wanted to relaunch the character with the technology they had to work with at the time. Rather than a grouping of polygons, Gex was built with a full skeletal system, with more bones than a real gecko, and a 'skin' stretched over-top to eliminate pop and tearing. This also allowed him to move his mouth along with the voiced dialogue. The developers of the game were huge fans of The Simpsons and built a lot of comedy set-ups based upon that style of humor. Dana Gould, one of the writers from The Simpsons, worked on the script for Gex: Enter the Gecko, and advised the Gex team on different directions for the character. The end result of the idea gave Dana Gould over 700 voice-overs for Gex, while giving the character different costumes in order to suit the mood of the levels. When the game was released for the Nintendo 64, over 500 voice-overs from the PC and PlayStation versions were cut out from the original version, giving the Nintendo 64 version roughly over 100 samples to work with for the purpose of the hardware's limitations at the time of development. When Gould was being interviewed for the game, he explained how Gex in the third dimension differed from other platform games at the time. Gould said "The character's natural God-given abilities lend themselves extremely well to designing 3D gameplay." Gould reprised the role of Gex in the game for the American market, although the British version featured the voice of Leslie Phillips instead. The designers put heavy emphasis on variety in the levels, in order to both give each world a different feel and help the player find their way around by creating recognizably unique landmarks. Gex: Enter the Gecko received mostly positive reviews. Aggregating review website GameRankings gave the PlayStation version 81.70%; however the Game Boy Color version 57.00%. The Nintendo 64 version received mostly mixed reviews. Aggregating review website GameRankings gave the game 60.50%. Upon the PC version's initial release, USA Today gave the game "4 out of 5 stars!" GamePro acclaimed the game to be "A must-own for platform fans!" However, Game.EXE reviewer gave the game a 70% score and said that it lacked attention to detail and care. A Game World Navigator reviewer praised the graphics, noting that the backgrounds are detailed, but noticed that the monsters have few polygons. The reviewer complained about the bad behavior of the camera, and eventually concluded that the game is worth playing. Dmitriy Estrin, reviewer of a Strana Igr magazine, commented on the graphics, saying that the "developers skillfully managed the resources available to them". However, he also noticed that the game had "too much simplicity in all aspects of the gameplay". ^ "In the Studio". Next Generation. No. 28. Imagine Media. April 1997. p. 19. ^ "Gex: Enter the Gecko Credits". Allgame. Archived from the original on November 15, 2014. ^ "NG Alphas: Gex: Enter the Gecko". Next Generation. No. 31. Imagine Media. July 1997. pp. 114–5. ^ a b Господин ПэЖэ (July 1998). "Gex 3D: Enter the Gecko". Game.EXE (in Russian). pp. 28–29. Retrieved 2019-01-14. ^ a b Гога Штангенциркуль (July 1998). "Gex 3D: Enter the Gecko". Game World Navigator (in Russian). No. 015. p. 33. Retrieved 2019-01-14. ^ a b Дмитрий Эстрин (March 1998). "Gex: Enter the Gecko". Strana Igr (in Russian). No. 03 (22). p. 128. Retrieved 2019-01-14. 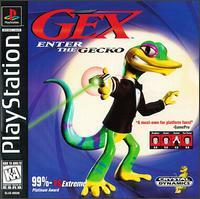 ^ "Gex: Enter the Gecko (PlayStation) reviews at". GameRankings. 2011-10-24. Retrieved 2011-10-24. ^ "Gex: Enter the Gecko (Game Boy Color) reviews". GameRankings. 2011-10-24. Retrieved 2011-10-24. ^ "Gex 64: Enter the Gecko (Nintendo 64) reviews". GameRankings. 2011-10-24. Retrieved 2011-10-24.